Licentiate of the Royal Schools of Music (Music Theory) in 1988. Graduate of the United Academy of Music (Theory & Composition) in 1990. Licentiate of Trinity College of London (Compositional Techniques) in 2003. Bachelor of Music (First Honor) of HKAPA (Composition and Electronic Music) in 2003. 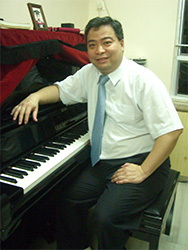 Master of Philosophy of CUHK (Music Theory) in 2005. Master of Philosophy of HKU (Musicology) in 2007. Hang Seng Bank Hong Kong Scholarship 2001/2002. The Hong Kong Bank Foundation Hong Kong – Mainland Exchange Scholarship 2001/2002. Liberal Arts and Interdisciplinary Studies Dept. of HKAPA – Foreign Exchange Student Scholarship 2002. Hong Kong Peninsula Hotel – Peninsula Suite Scholarship 2002. New Generation Concert 2001 – Best Composition Commission Award.